London may be great for parks, but there’s nothing quite like having a garden you can call your own (along with produce from it that you can enjoy). Space, of course, is the biggest issue – but even the smallest patio, terrace, balcony or windowsill can flourish into a miniature oasis. Here are some essential tips to get you set up as a successful urban gardener. Spend some time choosing the right containers for your project. Obviously they need to fit whatever space you’ve got; also make sure they’re 8-12 inches deep to allow for root growth. If you’re in a particularly eco-friendly mood, we recommend you get 100% recycled garden pots – slightly more expensive, but they won’t weigh on your conscience. Make sure your containers have holes in the bottom for drainage too. There are a few different factors to take into account here. Go for sturdy plants that stand a good chance in London’s temperamental climate: carrots, beetroot, shallots, lettuce and kale are among those that should thrive. Herbs, chillies and tomatoes should fare better on windowsills (they brighten up the place too). Oh yes, and grow stuff you know you’re going to use. There’s no point in growing a kale patch if you can’t stand the stuff! To go with your containers, you’ll need good quality potting soil – lighter than ordinary ground soil, and fertilised too, giving your plants a much-needed boost. Look into extras like water crystals and fertiliser pellets as well – these can often be the difference between a bumper crop and a harvest washout. Also – in case you haven’t noticed, it rains in London; don’t over-water your plants, or they’ll drown! There’s nothing quite like seeing an urban garden in action to get you inspired – and there’s no shortage of them in London. 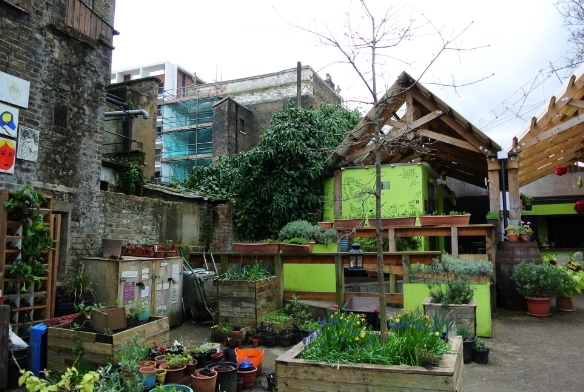 Go to the moveable Skip Garden at King’s Cross (not only do they grow their own stuff here, they turn it into great meals you can eat), Dalston’s wonderful Curve Garden, the Caravanserai at Canning Town or any number of the guerilla gardens dotted across the capital. Maybe you’ll even be inspired to try your hand at bee-keeping – an increasingly popular London pastime (the Geffrye Museum in Hoxton has five hives!). People in London are doing urban gardening everywhere, and it’s time you joined the revolution!